Busy and hectic life it seems. It's Thursday but hey allow me to do this Random Wednesday post! I just can't wait to blog about this! Thanks Foong!! Thanks sooo much!! I was still not feeling well and ended up no more night owl during weekends! I woke up the next day and rushed to church. Back from church and on my lappy. Saw this one from Foong! We all know that this Panda Foong can play piano very well! He sent me his version of Twinkle Twinkle Little Star! Let me share this with all of you since you guys can't get this from anywhere! I had a great time hang out with my godsister on Tuesday! Movie + Chit-Chat + "Yumcha" = Heaven Time with her! Hope it's not gonna be a nightmare for you guys? Mooncake festival is coming and I know many of you start eating mooncakes! I am going to get some cute lantern for me to play with my sisters for the night! I am supposed to post up something special for all of you but I still haven't finish it. So, just waiting for it okie? And of course it comes out with something special, isn't it? @Mariuca hahaha!! SSG?? So So Gembira? That smokey eyes one oso I like, makeover is it??? Phewittt! ok ok now i know! LOL!! wah, so nice of the Panda to play the song using piano, recorded and send to you woh.. i also want that!!! 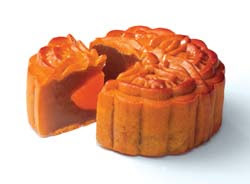 yeah, mooncake festival is coming.. i don't really fancy eating mooncake, a bit too sweet for me..
awwwww... that Twinkle Twinkle Little Star.... can melt any heart.. coz it's very soothing.. very calming.. very NICE! alamax... too bad tak der that PIC that i like so much.. haih..
Great music and you also look great in both pics. I have not tried mooncakes yet. I will have to try them. yep, i hear it. Foong is the best !! @BillThanks Bill! haha! yea u shud try! :) very yums! Yay! Love the song too! Waiting for Foong to play another one! LOL! No. 2 so pretty - both...No. 3...so fierce... No.4 so sweet - I want!!! You send to me for Mooncake Festival or not? LOL!!! Wow, I wished I play the piano as good as that. thanks for sharing this "exclusive" version caroline. hmm i can't see the video.. u mean must download? Wow, now that is some nice make-up. Very pretty. @Gee Hehehe very nice right? this is really an exclusive version indeed! ;D welcome! @Monica ehh? y dnt like mooncake??? hehe nice ma. @ChrisAu hahaha thanks for the nice compliment!